Posted bykaat	 June 6, 2013 June 6, 2013 3 Comments on We’ve Got Wheels! 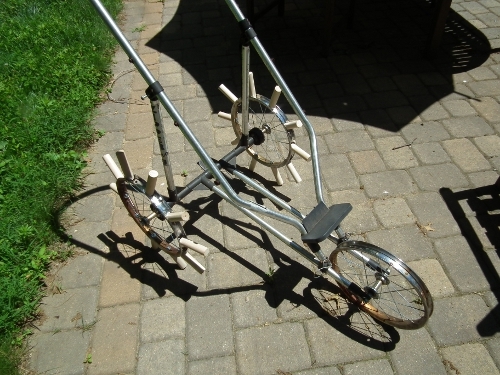 My friend R came to help me chop up a dowel and screw all those pieces into the rims of this old jogging stroller. I picked it up from the Give-and-Take at our landfill years ago – see, I *knew* we’d have a use for it! The back wheels are spaced just about two feet apart, so if we wanted rows spaced 1 foot apart, we’ll just start the next row in the middle of the previous one. 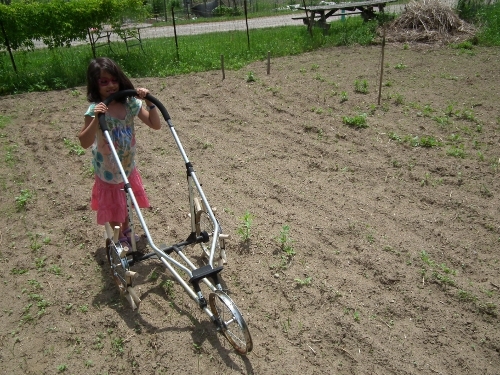 Amie and I took the thing for a quick trial spin in the Community Garden plots today. It works pretty well, but it will work really well once we re-tighten some of the dibbles and put a bucket of water or some such on top of the middle frame to weigh it down. We might want to see if we can add a watering function to that… It would work perfectly if we could locate a giant pencil sharpener and give the dibbles sharp points. It’s going to rain over the next couple of days which gives me more time to tinker. Let the soil recharge and then, first fair weather day, we’ll go and sow. now that’s innovation for the future!